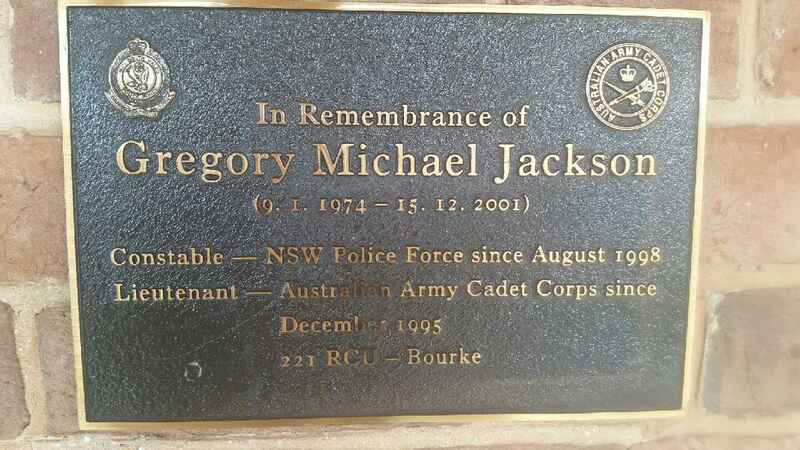 Gregory Michael JACKSON memorial plaque on the front wall of Bourke Police Station. Greg’s plaque is the the left of the window on the left. The plaque on the right of the same window is for Ash BRYANT. 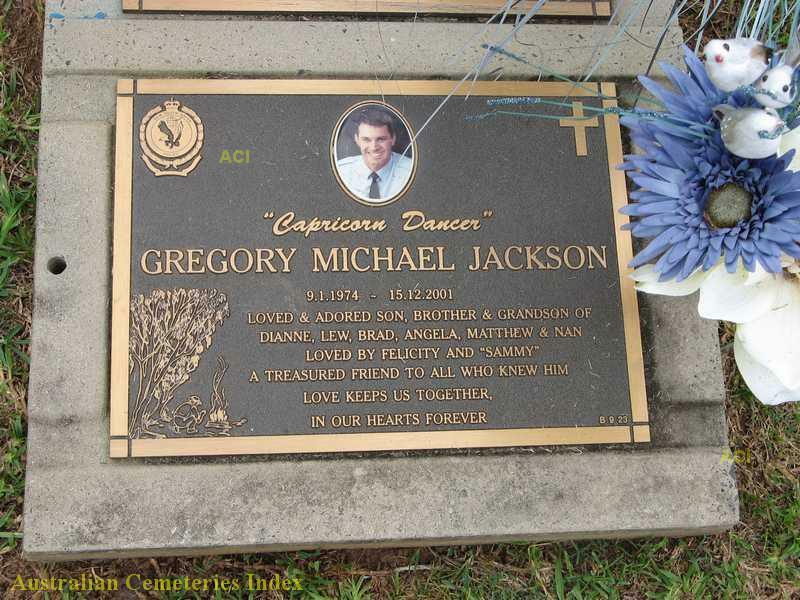 Gregory Michael JACKSON grave plaque in the Lawn section of Coffs Harbour cemetery. Nov. 13, 2003, 9:47 p.m. 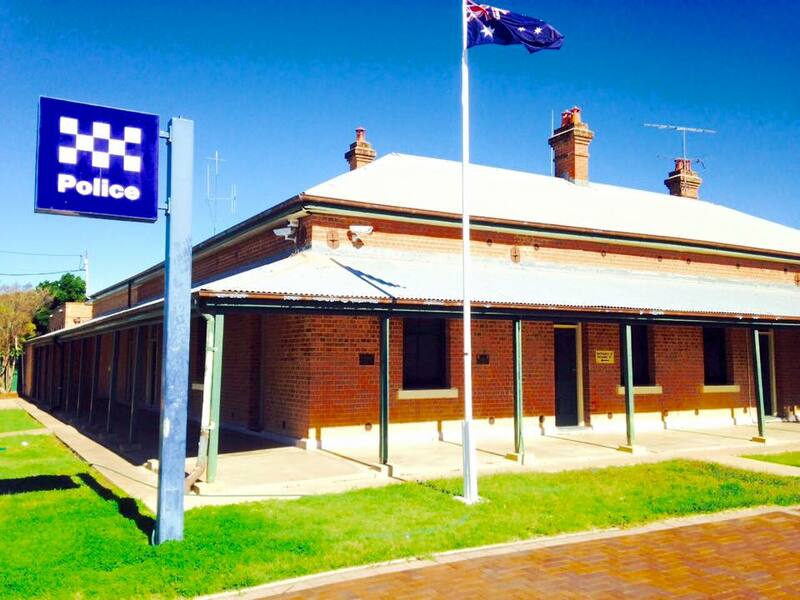 The State Coroner yesterday found a Bourke policeman who was knocked off a bar stool at a police Christmas party died in a “tragic misadventure”. An inquest at Dubbo and Sydney heard that Constable Gregory Jackson, 27, died from head injuries three weeks after falling head-first off a bar stool at the Bourke Golf Club. 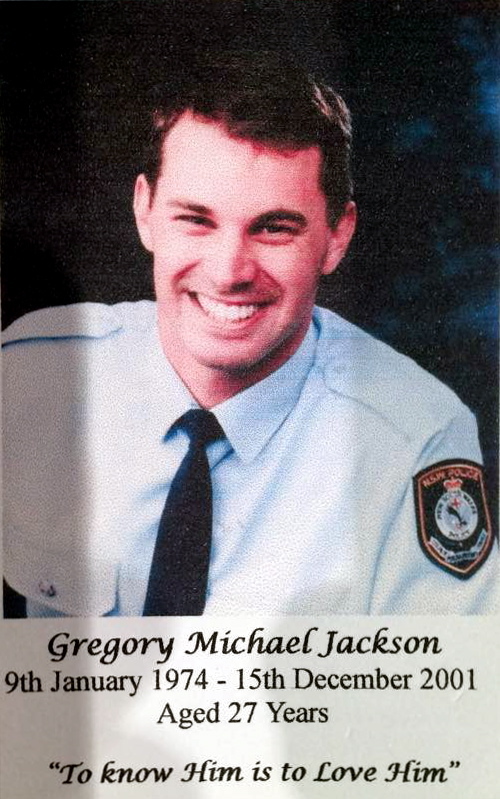 Mr Jackson and his colleagues were celebrating at their Christmas party on November 24, 2001 when the incident occurred about 3.30am. Mr Jackson was dancing on a bar stool in the middle of the dance floor but was knocked off balance by a colleague and fell to the floor. 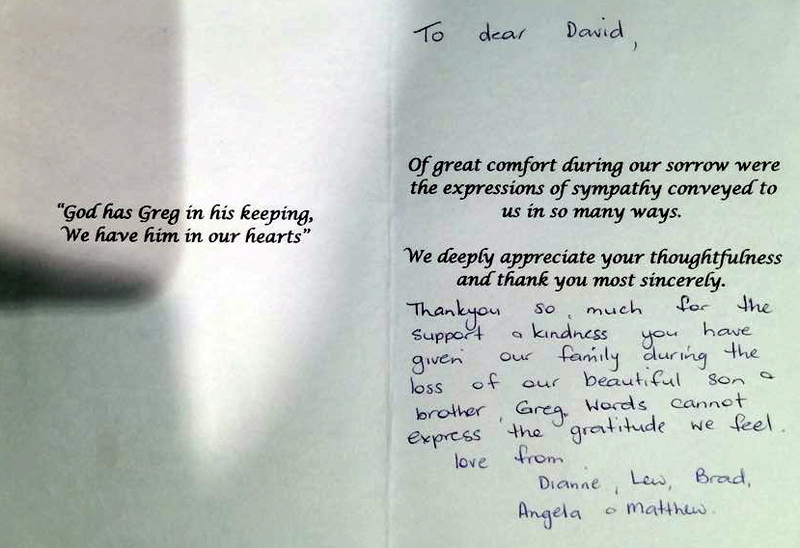 He died in Sydney’s Concord Hospital from head injuries three weeks later. Delivering his findings, Coroner John Abernethy said the police officers still at the club were “happy, moderately-intoxicated and intent on dancing”. The officer who knocked Mr Jackson from the stool was “affected with alcohol and in exuberant high spirits”, he said. He said Constable Melanie Butcher made innocent contact with Constable Jackson’s legs, bumping into him either while running towards him with her arms outstretched or trying to climb onto a nearby stool. But the contact “had the disastrous effect … of causing Constable Jackson to lose his balance and fall to the floor causing him a serious head injury”, Mr Abernethy said. He also found Constable Jackson’s conduct – dancing on a 64cm tall bar stool – “had an inherent danger to it”. Mr Abernethy dismissed suggestions the stool had been kicked out from under the officer and said no charges should be laid over the death. “There is no criminality at all in the incident and I see it as simply a very tragic misadventure,” Mr Abernethy ruled. However, he criticised police for the three-month delay in investigating Mr Jackson’s death, saying the lapse of time was “both significant and unwarranted”. Before the first of two official police investigations began in March 2002, “the death of a fellow police officer was being treated … in a somewhat cavalier fashion”, he said. Mr Abernethy was also critical that the first investigation – though sound – was run by a police officer who knew Constable Jackson and other officers involved in the incident. “The decision ran the risk of a perception of a conflict of interest and lack of transparency,” he said. He recommended that future NSW police investigations into coronial deaths of police officers be conducted only by an impartial investigator. 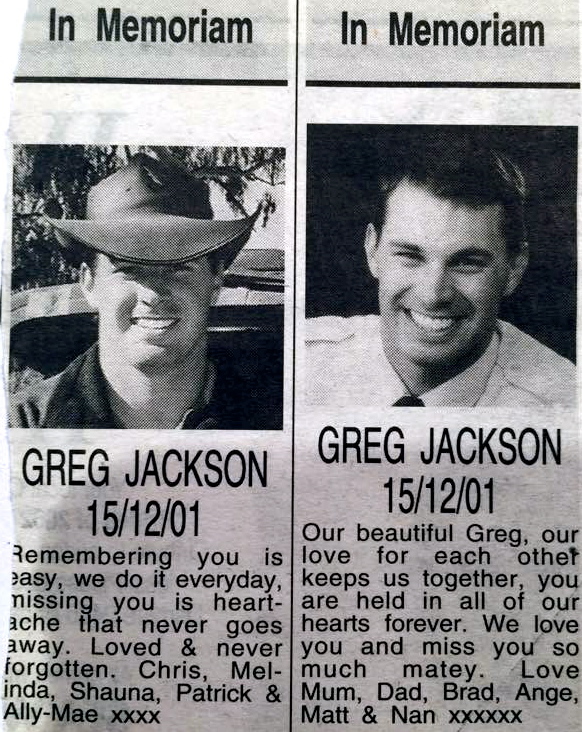 Greg was an avid 4 x 4 driver and is the brother of Brad Jackson.